A guy on a swing. Revive Ohio. Their foundation for reaching people is founded upon the principles found in the Gospels. They believe Jesus is the best example to follow when sharing the good news. Love: Love looks like something. Love may look like an act of kindness or a caring hug. Love could look like a bottle of water on a hot day or a sandwich to a hungry homeless person. Listen: To listen means slowing down on the inside to really listen with your ears and with your heart. Listening to the person you are talking to and listening to the Holy Spirit upon and within you. Discern: Asking questions, what does this person need to know about Jesus? What’s is their spiritual address? Where is this person on their journey toward faith? Are they far away? Are they thinking about Jesus? Are they close to entering the Kingdom? Are they jaded by church and religion? Are they open or closed? Respond: Appropriately responding to the person by being kind, helpful, interested, caring and loving. Share the Good News appealing to who they are and where they are. Asking them to respond to the Good News. It’s the love component that stirred my heart. Love enables us to listen, discern and respond. Love is both an attitude of our hearts and an action. Love enalble us have focused listening… an ear toward heaven, and an ear actively listening to the person we are speaking to. Learning to be a person who loves well, takes time and practice. This is the greatest challenge for every person who trains others to reach their world. Methods are easier to learn than being a person who loves well from the heart. People using a method, rather than loving and interacting with a person is a personal frustration. Jesus was probably just a little frustrated. He had two disciples who wanted to call fire down from heaven and nuke a town. Wrong attitude. Wrong response. Honoring a person’s space, and honoring their right to end the conversation at any time is part of loving a person. Questions to ask ourselves. Am I being kind? Am I being patient? Am I seeking my own success? Am I just going through the process of this method, or do I genuinely care about the person I am talking to. “The people we reach are not projects, nor are they targets. They are human beings who are fearfully and wonderfully made. They are created in the image of God and are deeply loved by God. Every person on earth has a life story which filters their world-view. People are complex, and most have a God history. Their experiences and their pursuit or non-pursuit of spirituality is unique; no two people are alike. This understanding is the beginning place. We must ground ourselves in this truth as we seek to share who we are and what we have received with others. How well people are listened to, understood, spoken to, and loved by you and me is all important. When we arrived there was a man on a swing. He was the only person in the park. We walked up and started a conversation. As the conversation continued we discovered his life was a train wreck… not of his making or choosing. He mentioned three different tragic relational, and health issues. He was sitting on the swing pondering the shattering events of his life. Any One of the issues he was facing would have destroyed most people. He needed hope. That day, this one man on a swing, was the day he encountered the God of all Hope. He decided to follow Jesus. The Bible and wristband Revive use to share the Gospel were a great help to communicate the good news in a way he could understand. We prayed with him and for him. When we left he was sitting on the swing reading the Bible we had just given him. The hour and a half encounter became one of the most radical encounters I’ve ever had in my life. I still have the map. Reaching out effectively requires us to love in attitude and in action. Practicing Love, Listen, Discern and Respond are great attitudes and life skills to practice. You can use the four steps with your family, friends, people you meet or with the people you are reaching. People want to make a difference….this year over 300 Ikea Bags went out the first weekend in November. Yes we are ordering more. People like simple…people grab a bag as they leave a weekend service. The instructions stapled to the bag help guide people as they purchase the food items. People enjoy the sense of togetherness…We encourage participation: families packing the bag together, or joining with friends, or joining as a small group to fill the bag. Be creative by adding a worship set and breaking up into small groups for prayer…then introducing the team leaders, and receiving instructions and maps. Some people like to participate but don’t want to go on the outreach…that’s ok, participating at any level is appreciated. The ‘no go but want to serve people’ will bring their filled boxes at 9:30am. The others show up at 10:30am. Have a crew at both times to help people unload then load the dinners. People like the fact that we go to the areas we have consistently served in the past…example: we will be divided up into three huge teams, caravan to the locations in order to reach out to three apartment complexes in different parts of the city. People like the adventure…we go to apartments unannounced, offer the Thanksgiving meal and offer prayer. When we leave the home we place a small sticker on the door notifying the rest of the team that the stickered door is a home we have served. People who serve begin to see life through an outward focused lense…One family went to a home and offered the Thanksgiving dinner. The single mom invited the family inside to place the dinner on her table. The family noticed…all she had in her apartment was the table. Their perspective changed. Their hearts were softened through the experience and began to view life through a different lens. Going, serving, praying = caring for others …an outward focused life. Thanks so much for helping to make Thanksgiving possible. This year’s date for Turkeys Giving Away Turkeys is Saturday, November 17th. We will meet at 10:30am and join team leaders to head out to three different locations. (we go to low income apartments un-announced. 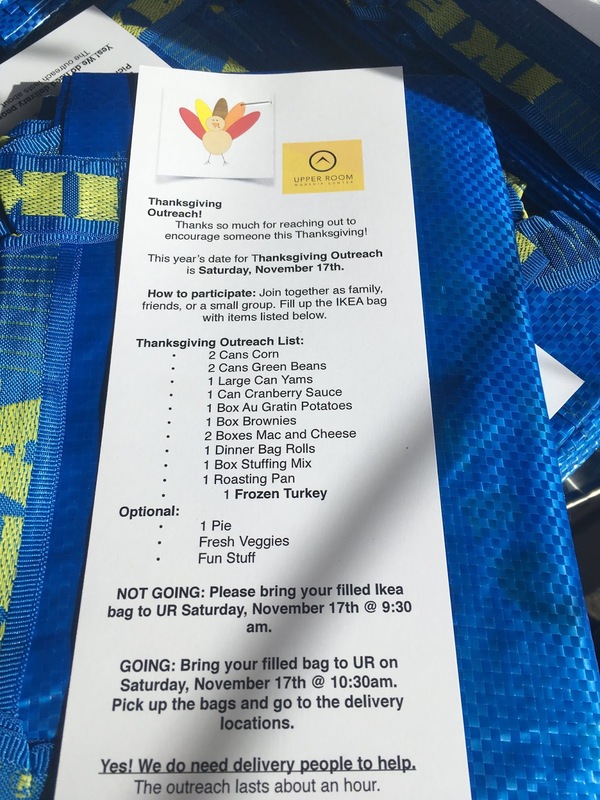 How to participate: Join together as family, friends, or a small group to fill up the IKEA bag with items listed below. If you are going on the outreach… Please leave your dinner box in your car come in for instructions and to join a team. If you only want to participate by filling a turkey dinner and not go on the outreach…Please drop the filled bag off at 9:30am. KindnesstoGo encourages outward-focusedness within congregations, seminars or conference participants. 1. the state or quality of being kind. 3. favor: his many kindnesses to me. 4. kind behavior: I will never forget your kindness. KindnesstoGo Outcomes: Small simple acts of kindness bring the giver and the receiver of the act of kindness into a relationally connective experience. Len Sweet once used this communication filter to encourage leaders to develop sensory tools to help in their communication with not-yet-believers. EPIC: Experiential, Participatory, Image-Based and Connective. Kindnesstogo incorporates all of the filters. Participatory: both the giver and receiver participate. The giver gives, and the receiver receives. Experiential: a positive experience is shared. The giver experiences the emotional lift of sharing with another individual. 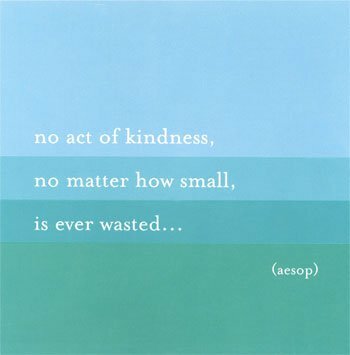 The person receiving the small gift or performed act of service experiences kindness and love. A kind act, done with great love, enables both the giver and the receiver to experience a positive touch of God’s love. If the kindness item is a drink or a food item the receiver receives the pleasure of eating or drinking the expression of kindness. This reinforces a positive experience in the memory/feeling part of their being. A relational experience flows through the personal conversation, connection, and through the act of kindness or service expressed with authentic care. Image-Based: The image is attached to the small gift and the meeting of the giver and the receiver. The giving person is part of the positive image. The image is also an item: a cup of coffee, a bottle of water, a care gift bag, a granola bar etc. The image of someone serving another human with no strings attached, and being on the receiving end of a kind act remains embedded within a person’s memory. Most people with share their experience with others. Connective: The connective act of kindness also relationally connects the heart of both the giver and the receiver. The positive connection intensifies as conversation and authentic love flow. People quickly pick up items to be shared after church, a conference session, or a seminar. They read or listen to the simple instructions. They then go and do. People pick up gift bags and go. They give the bag and the connect card as a positive intentional act of kindness to restaurant workers, servers at drive-thru eateries, grocery store check out people. etc. One Story: Flowers at a drive-thru restaurant. Here’s the story of a worker’s amazing encounter: I wanted to share this. This is from the mom of one of my son’s friends. I know she’s been going through some things and was blessed by yesterday’s outreach. She posted this yesterday. I fully believe I looked at the face of an angel this morning. I would like to share that experience with you, my friends and family. A tragedy struck my family recently and while I cannot go into detail publicly, I can tell you it left me very sad this morning. I’m at work, at Arbys, and this car pulls up to the drive-thru without placing an order. I open my window and this stranger, whom I’ve never ever seen before, presents me with this beautiful bouquet of flowers and tells me he’s there to spread God’s love and asks can he say a prayer for me. And right there in my drive-thru, I held his hand as he prayed for me to help me to have a good day and for strength. I have never been so overwhelmed in my life at this unexpected and almost immediate answer to my prayer to help me and my family to get through this difficult time. Shelbi Louise and Cassie Ovalle got to share in this beautiful moment with me as well. There’s no denying in my heart and in my mind that this man was sent by God Himself to help me. I do not believe in a mere coincidence. I hope this strangers kindness comes back to him a hundredfold because this one act of kindness for me absolutely changed my day. I hope he is rewarded for his blessed generosity. God bless this man and thank you for reading this. Peace to all of you. There is also a spiritual dimension of an intentional act of kindness. When we join Heaven’s kind intention, the Holy Spirit bears witness to our kind acts/good deeds done in the name of Jesus. postscript: The man who gave the flowers to the lady at the drive-thru is fairly new to outreach. After learning about waiting, pausing, and listening to the Holy Spirit, he practiced what he heard by pausing and asking… Jesus, “What is her greatest need?” He sensed she needed… Strength. So he prayed for strength. Strength was her greatest need! Wow! We serve a living, loving Savior! Our acts of kindness break down barriers and build bridges into the people’s hearts we love and serve. Good deeds, create goodwill that open hearts to the good news. Rusaw Swanson The Externally Focused Church. My other website eyesoutward is an on-going adventure. KindnesstoGo is a simple, quick, and fun way to move people into the outreach arena. People pick up items during or after a service. Simple instructions are attached to the outreach item. People follow the instructions and reach out to their community. Take the gift bags to stores, drive-thru fast-food locations, or give to your server at a restaurant at the end of your meal. Tip Big! Sometimes a conversation will emerge as people ask questions. Follow the conversation as long as you are enabled. Sometimes there are prayer opportunities after a great conversation. Offer to pray a short 10-second prayer. “Could I pray a short prayer for you?” Hold out your hand. Most of the time people will hold your hand. Pray with your eyes open. You will be able to see their expressions and you will be able to love with your eyes as they usually keep their eyes open. Remove this note after you’ve read the instructions.